Everyone I’ve learned geology from has been “the most important” in some respect. But when Simon Wellings at Metageologist offered up this theme for Accretionary Wedge #44, one name sprang to the head of the line: Lockwood DeWitt. That trip pretty much changed everything. I’d been doing this all on my own, picking up what I could from books and blogs and nuggets of wisdom from folks in the geoblogosphere, but none of that can do what getting out on the rocks with someone who knows them can do. And Lockwood isn’t in to this “Look at that feature, isn’t that great?” sort of geological sightseeing. He wouldn’t tell me what we were seeing. He’d give me a few hints and wait for me to painfully piece some of it together before he’d tell me what we were looking at. I’d been out of school for well over a decade, I was a complete amateur at geology, and here was this dude who looked a little like Santa Claus giving me bags of gorgeous geology and expecting me to figure it out. Inspecting features in the basalt, Cape Perpetua. Image Credit: Cujo359. I saw my first slickensides, some of the greatest pillow basalts in the universe, actual gabbro in the wild, tide pools threaded with dikes, and Devils Churn. I saw flesh-eating plants. 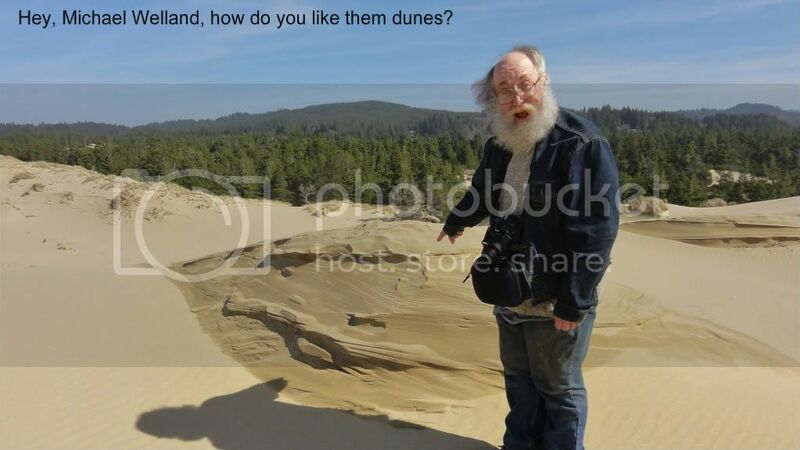 I saw dunes. I saw more than you could imagine a person could in two days, and learned more than I realized. Moments from that trip pop up all the time, as I recognize a feature and put it together with something Lockwood showed me. I often wished, when I got home, that I’d had some way to record everything he said. So I bought a digital recorder for the second trip we took, a several-day extravaganza through the Oregon interior. This was the trip where I saw Crater Lake for the first time, learned about lineaments, found faults, enormous fault scarps, and the greatest rhyolite outcrop in the universe. Lockwood at the world's greatest rhyolite outcrop. Lockwood demonstrating why this is the most awesome rhyolite outcrop in the universe. I’d had no idea until then that rhyolite could do such things. And what about eruptions under Pleistocene lakes? Yeah, we had that covered, too. That’s not just a tuff ring, mind. It’s also got wave-cut platforms, and the place is lousy with old shorelines. Which, because of Lockwood, I can now spot at 60 mph. We’ve done a lot of geology at x-mph. Being out with Lockwood challenges my brain and my car. We took that Honda Civic of mine all the way up to the top of Paulina Peak. This may not sound impressive until you realize it’s a one-lane road that’s washboard and practically vertical in places. But we made it, and from there, we could see a huge variety of volcanism. After that trip, even without listening to the recordings, I realized I’d picked up far more than I’d realized. When I’m out with Lockwood, it’s like drinking from a firehose. I feel like I’m not learning a damned thing, it’s all going by so fast. Then, a month or two later, I run across some concept he’d taught me, things go click, and once again I’m thanking the internets Lockwood and I ran across each other. Lockwood at Beverly Beach, pointing out concretions in the Astoria Formation. Our most recent trip through the central-southern Oregon coast and inland through the Coast Range was just the two of us – I left my poor intrepid companion home. And it’s another of those trips where I’m boggled by the sheer amount of stuff I learned without realizing. It’s got to the point now where I can sometimes contribute an intelligent bit to the conversation. I recognized some fine slickensides all by me lonesome. That, I have to tell you, was a moment of bliss. All of you who’ve ever studied the sciences know that feeling, the one that comes when you can show your teacher that you’re really getting this stuff. Lockwood pointing out some sweet cross-bedding at Oregon Dunes. I’ve already talked about the strike-and-dip revelation. That’s the kind of thing Lockwood does: points me to features, lets me guess at the answer, then demonstrates how to solve the puzzle. It’s okay to make mistakes in his presence. Like the best teachers, he doesn’t make me feel like an idiot for getting things wrong. He just shows me how to get them right. And he’s taught me it’s okay to say, “I don’t know.” Nobody knows it all. We can admit that, and work to fill in the gaps. He’s brought me to the point where I’m comfortable playing the geological host me own self. A lot of what I recognized at Seward Park this last time came from him. And who knows what’ll happen after this next trip we’ve got in the works: a wild ride through the Josephine Ophiolite in California and then back up through Quartzville in Oregon. If I ever do go back for a formal degree, one of the reasons it won’t be hellaciously difficult is because I’ll be saying, “Oh, I saw something like that with Lockwood” about every three minutes. Lockwood demonstrating strike and dip at Sunset Bay, Oregon. It’s not just me. There’s a considerable contingent of the geoblogosphere that relies on him. He’s one of the most knowledgeable folks around, and always willing to share that knowledge. Drop by Corvallis, and he’ll be more than happy to take you round the local delights. Talk to one of the Northwest geobloggers, and you’ll hear his name come up with a reverence usually reserved for scientists like Carl Sagan or Stephen J. Gould. We loves us our Lockwood. I owe him more than he’ll ever admit to. One of the main reasons I felt comfortable writing for Scientific American was because I’d learned from him, and I know he’ll be there to answer questions. Jim Bennett got me started on this whole geology addiction. Lockwood’s brought it to a whole new level. I can’t wait to see what he teaches me next! I’m particularly enjoying the same image of Lockwood at the dunes. And the fairly even and open background is just ripe for word balloons/text. There is a series of books called “The Roadside Geology of ____” that you might find interesting. If cindercones and shield volcanoes turn you on … try the Springerville area of AZ. Cindercones galore, and you can ski on the remnants of a shield volcano. Basalt flows over “crudstone” (ash deposits? ), etc. When I took a field camp course in 1972 it started with a trip between Rapid City and Cardwell Mt. That was learning geology from a fire hose, the days were 7 to 6 thru the Black Hills, Badlands, Devils Tower, Thermopolis, Yellowstone, Red Lodge, Mt (Beartooth Plateau) etc. One learns an aweful lot of geology very fast. Field camp then was learning how to map, (all be it back then it was the old fashioned way with no GPS just a topo sheet and an aerial photo). I suspect if you ask most folks in geology who went thru a field camp, they would say that that was the greatest learning experience. You are getting the equivalent of one from Lockwood. Of course then as I have commented before you are also learning geology as Charles Darwin did. Undergraduate field camp it was, 1971, “Geology of the British Isles” thorough the University of Illinois, led by Dennis S. Wood. Dennis had an impressive pedigree, Robert Millner Shackleton having been his adviser at Liverpool. Dennis was among the last in the great tradition of British field geologists who worked hard, played hard and had an intuitive grasp of what the rocks have to say on any scale. Without his guidance, I would not have gone to graduate school where I did and would not have acquired his appreciation for the beauty, mystery and majesty of of the solid component of our world. Hutton’s Unconformity at Siccar Point; Arthur’s Seat in Edinburgh; the structures of the Dalradian, Lewisian and Moine; diamictites on the Garvellach Islands; Cambrian sequences and a trip to the bottom of a coal mine in North Wales; live scallops and lobsters, fresh off the boat in Scourie; Dennis’s uncanny ability to lead us deep into the highlands and out along a different route that invariably intersected a pub by the side of the road…all of this and more had an enormous influence on me at that age when we are all so impressionable. That I didn’t follow his trajectory into college/university teaching as I had initially hoped has always been a disappointment. 10 years doing oilfield geology in the Rockies and, now, my third decade of teaching high school science will have to suffice as my modest attempt to embrace the geologic life that people like Dennis Wood lived with a passion. It’s nice to know someone else who thinks Lockwood is such a wonderful and special person. I’ve only had the privileged of knowing him as a friend before he got into geology, but can just imagine what a great teacher he is now. He would always blow me away with the stuff he would know. I just wish I lived closer to the Pacific Northwest so I could go on an outing with him. I know I would ending up learning so much from him – you can’t help it when you are around him.